One of the great linebackers in pro football history, Ham played his entire gridiron career in his native state of Pennsylvania: high school in Johnstown, All-American at Penn State, and 12 years with the Pittsburgh Steelers, where he was a member of four Super Bowl championship teams and was All-Pro nine straight years. He intercepted 37 passes in his career, including 32 during the regular season, third highest in NFL history among linebackers when he retired in 1983. Ham was the only unanimous defensive choice on the NFL’s Team of the Decade for the 1970s. Jack Ham was born to be a linebacker. “I’ve played the position ever since I went to a Polish grade school (Assumption) in Johnston, Pennsylvania,” Ham explained. From there it was nothing but a series of football honors for the 6-foot-1-inch, 220-pound dynamo-All-State at Bishop McCort High School in Johnston, All-American at Penn State, and All-Pro for the Pittsburgh Steelers. Ham received Penn State’s last scholarship in 1966 and went on to letter three years, 1968-69-70. During that period, the Nittany Lions won 29 games and lost only three. As a senior he led Penn State with four interceptions and 91 tackles and was selected on every major All-American team. Ham still holds the school record for most blocked punts, three in 1968 and four for his career. Ham had standout games in Penn State’s Orange Bowl victories in 1969 and 1970. His other collegiate postseason experiences included the East/West Shrine Game and the Hula Bowl, where he was named the Outstanding Defensive Player. The leading vote-getter in the 1987 National Polish American Sports Hall of Fame election joined the Steelers in 1971 as a No. 2 draft choice. He became a starter as a rookie, clinching a regular position with a three-interception performance in the final pre-season game against the New York Giants. In his prime, Ham earned the reputation of being almost a perfect player who defended both the run and the pass equally well and rarely made a mistake. He was not as colorful as some of his teammates, but was always one of the most popular players among Steelers’ fans who appreciated his accomplishments on the field and his quiet class off it. In 1972, he had a career-high seven interceptions and made All-Pro for the first time. Ham scored his only two NFL touchdowns that season with a 32-yard interception return and a fumble recovery. Ham was an All-Pro selection for nine consecutive seasons and was the only unanimous defensive choice on the NFL 1970′s Team of the Decade. He was elected to the Pro Bowl eight years in a row (1974-81) and was named NFL Defensive Player of the Year in 1975. Ham’s most impressive statistic is his 32 regular season interceptions, the third highest in the NFL history by a linebacker. He also added five post-season steals, two coming in the 1974 AFC Championship game against the Oakland Raiders. The first interception stopped an apparent Oakland scoring drive, and the second he returned 24 yards to the Oakland nine-yard line to set up the winning touchdown. The Steelers went on to win their first Super Bowl two weeks later. 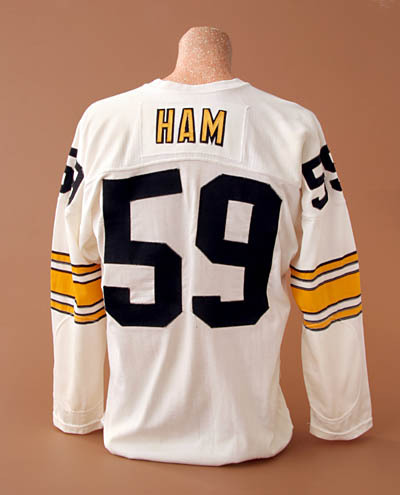 At the peak of the Steelers’ defensive success in the mid-seventies, Ham combined with end L.C. Greenwood and tackle “Mean” Joe Greene to form an almost impregnable wall on the left side of Head Coach Chuck Noll’s defense. This trio played together six times in the Pro Bowl. Number 59 retired following the 1982 season as one of the greatest linebackers in the history of the National Football League. He played 12 seasons with Pittsburgh and participated in 178 out of a possible 190 games. In 1988, Ham was inducted into the Pro Football Hall of Fame.